Golden Cockerel - Russian Store Online. 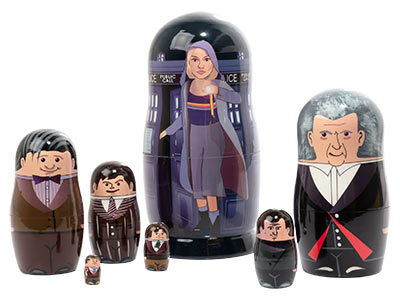 Looking for Russian matryoshka nesting dolls? You just found the matryoshka mother lode! And our huge selection of Russian stacking dolls just got bigger as Golden Cockerel bought out Tolstoys and now offers many new Russian handcrafted imports. We're located in North Carolina, where we stock all items for quick delivery. We produce the nesting dolls at our workshop in Russia. Our forte is making custom Russian nesting dolls: nobody does it faster, better, more reliably, with more pleasing results. Need something you can't find? Give us a call! Welcome to the largest selection of Russian Lomonosov porcelain housed in America! This fine china is truly porcelain fit for a Czar. Russia’s Imperial Porcelain Manufactury (formerly known as and still commonly called the Lomonosov Porcelain Factory) has fully licensed Golden Cockerel as their official distributor in the United States. Our warehouse in North Carolina is stocked with a wide variety of china patterns and a great menagerie of Lomonosov porcelain animal figurines, all ready to ship for quick delivery. Are you a reseller? For excellent Russian porcelain wholesale prices, please call our friendly customer service: 828-297-4653. We’d love to hear from you. If you're interested in selling our Russian nesting dolls and other Russian gifts, or if you have in mind a special product we can make for you, please check out our "Nesting dolls b2b" page. It showcases some of the custom projects we've undertaken for a variety of customers -- no matter what your business or promotional needs are, Golden Cockerel can help you come up with a uniqueproduct that's eye-catching, collectible, and sure to make your campaign a success! Looking for a clever way to make an unforgettable statement in your next marketing campaign? Picture this: A wooden doll which opens, piece after piece like words in a sentence, to reveal a concept. Give it to your customer and the novelty of the collectible doll will make a lasting impression, and be a keepsake. Would you like us to make one, or one hundred thousand, for you? Any way you want? We're celebrating 25 Golden Years of Importing Russian Gifts Fit for a Czar! What started as a year-long mission trip to the Soviet Union to build bridges of peace between adversaries has blossomed into a 25-year-old partnership between Americans and Russians to bring our countries closer together. Since 1993 Golden Cockerel has been making Russia's finest nesting dolls and sharing them with the world, Matryoshka serving as a smiling ambassador of Russia's good will. We made it!!! 25 Golden Years! Your patronage through thick and thin has kept us going. Thank You!! Open Monday - Friday 10am-6pm EST. Saturday and Sunday by appointment only.